Saturday Brunch (a la carte) 10am to 4pm. Menu includes an English Fry Up; Huevos Rancheros; 3-Egg Omelette; Neptune (crab cake, poached eggs, Hollandaise, brioche bread); Caramelized Banana Crepes; Belgian Waffles; Shrimp Tacos; Steak au Poivre; Seafood Linguini alla Fra Diavolo. KRAVE RESTAURANT (Marabella, San Fernando, Trinidad; (868) 658-5728). Saturday Breakfast Buffet 8am to 1pm. Breakfast buffet is $200 inclusive of VAT & service charge. Crepes, waffles, pancakes, eggs, omelets, signature sandwiches and more. (A la carte Breakfast is also offered from 8 am, Tuesday to Friday). Link to breakfast menu. LOLA’S FOOD COMPANY (Port of Spain, Trinidad; (868) 345-5439). Saturday Breakfast (a la carte menu) 8am to 11:30am. Casual, comfortable restaurant with tasty food + tabletop phone chargers and free WiFi. (Breakfast is served here daily.) Link to breakfast menu. KAPOK TIKI VILLAGE (Port of Spain, Trinidad; (868) 628-2000). Breakfast Buffet 6:30am to 10am. Breakfast buffet is $122 inclusive of VAT & service charge. A la carte menu is also available. (Breakfast is served here daily). All day Saturday breakfast (a la carte) 9am to 3pm. (All-day breakfast is served here daily 9am-3pm). Saturday “Lunchfast” (buffet menu) 11am to 1pm. “Full buffet breakfast and more.” PRICE – $185 exclusive of tax. UPPER CRUST PATISSERIE (St. James, Trinidad; (868) 628-8817) Saturday breakfast (a la carte) 8:30am to 3:30pm. Pancakes, omelettes, french toast, pastries and more. Occasional “buffet breakfast priced at $95 TT and it includes a live egg station, local items along with international items.” Saturdays 7am-10am. Call to confirm. PÊCHE PÂTISSERIE (Chaguanas, Trinidad (868) 223-2433) – Saturday Breakfast (a la carte menu) 8:30am to 11:30am. Breakfast menu is available daily including Saturday & Sunday. All day breakfast Tuesday to Sunday. Link to Dolce’s menu. Saturday breakfast (a la carte) 7am to 11am. Link to menu. (Breakfast is served daily 7am-10:30am). ALL OUT SPORTS BAR & GOURMET GRILL (Port of Spain, Trinidad; (868) 622-6730). Sunday Breakfast 11am to 2pm. Occasional all-day Sunday Breakfast (a la carte) 7am to 2pm. Includes pancakes, waffles, French toast, eggs benedict, tea, coffee and juice. Check the Canvas’ Facebook page or call to see if breakfast is on..
Sunday Brunch (buffet) 8am to 1pm. Local and Spanish flavoured buffet breakfast choices along with breads, arepas, empanadas, bacalo, meats, fresh seasonal fruits, and hot and cold beverages. PRICE – $185 plus taxes ($135 plus taxes); one child (under 8 years) free per adult. Sunday (and everyday) all-day breakfast (a la carte) 9am to 2pm. Sunday Brunch (buffet and a la carte menu) 12pm to 3pm. The iconic Hilton Trinidad rolls out a royal spread of fresh fruits, cheese boards, meats, breads, local foods, and stations serving standard breakfast fare like made-to-order omelets. PRICE – $355 inclusive of taxes & service charge; children under 3 years eat free; 3-11 years are half price. 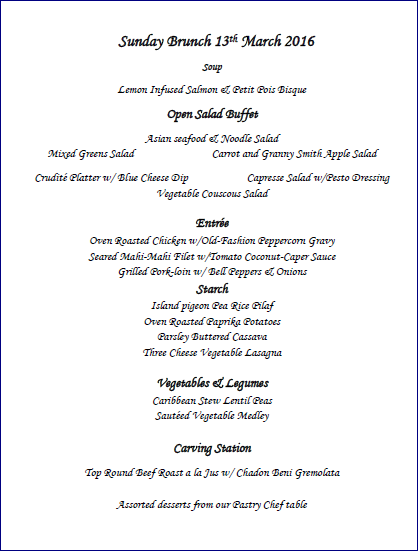 Sunday Brunch (buffet and a la carte menu) 12:30pm to 2:30pm. Full spread of local breakfast delicacies, egg and waffle stations, pastries and breads, cheese and meats, fresh fruit and more. PRICE – $380 inclusive of tax; children under five years eat free; 6-12 years are half price. Sunday brunch (buffet) 11am to 2:30pm. Enjoy brunch in an elegant but comfortable setting at JAFFA. Selection of breakfast foods, fresh juice bar, roast meats carvery, local specials, large salad bar with seafood, dessert buffet with chocolate fountain and ice cream. On the last Sunday of the month, brunch includes classic English dishes like Roast Beef & Yorkshire pudding, Fish & Chips, and Lancaster Hot Pot. PRICE – $275 plus VAT; $160 plus VAT for children under 12; children under 6 eat free. Sunday Brunch (buffet) 11:30am to 3pm. Ask for a marina-front seat and prepare to enjoy Sunday morning by the sea with live entertainment. The buffet includes a full breakfast station, soup of the day salad bar, a carving station, live grill bar, seafood station, main courses and desserts (link to sample menu). PRICE – $246 inclusive of tax; children 11 years and under eat free. Sunday Brunch (buffet) 7am-1pm at Maraval, Pointe-A-Pierre and Crown Point (Tobago) locations. Saturday and Sunday Breakfast buffet – $75 – $150 exclusive of taxes (buffet availability and prices vary according to location). Sunday Brunch (prix fix menu), first Sunday of the month, 11am-2pm. Three course brunch (shared plate concept). PRICE – 3-Course $300 exclusive of service charge; Boozy Package (3-course + bottomless mimosa and bellinis) $525 exclusive of service charge. Sunday Brunch (buffet), 10am-3pm. Omelets, waffle station, sausages, breads & pastries, bacon, hash browns, bake & buljol, fruit salad along with regular churrascaria grilled meats and other items normally featured on the buffet. PRICE – $245 exclusive of taxes, children under 12 free. Sunday Dim Sum (a la carte menu), 12:30pm-2pm. Choose from mouth-watering items like the Pan Fried Shrimp Dumplings, Har Gow and the Vegetarian Gow. Link to our Tiki Village Pictures and Dim Sum Menu. On select Sundays/Public Holidays Sunday Brunch (a la carte menu) is offered 9am-1pm. Pancakes, omelettes, french toast, pastries and more. Call to confirm. Sunday brunch (buffet), 11:30am-2:30pm. Not surprisingly, the Radisson’s 360 Degrees serves up spectacular views with its buffet brunch. PRICE – $346 inclusive of taxes. Sunday Brunch (family style – a la carte). 11am to 3:30pm. Highly recommend! PRICE – $325 inclusive of service charge; kids $120 inclusive of service charge. Reservations Required. Sunday Breakfast (a la carte menu) 7am to 12pm. (Breakfast is served here daily.) 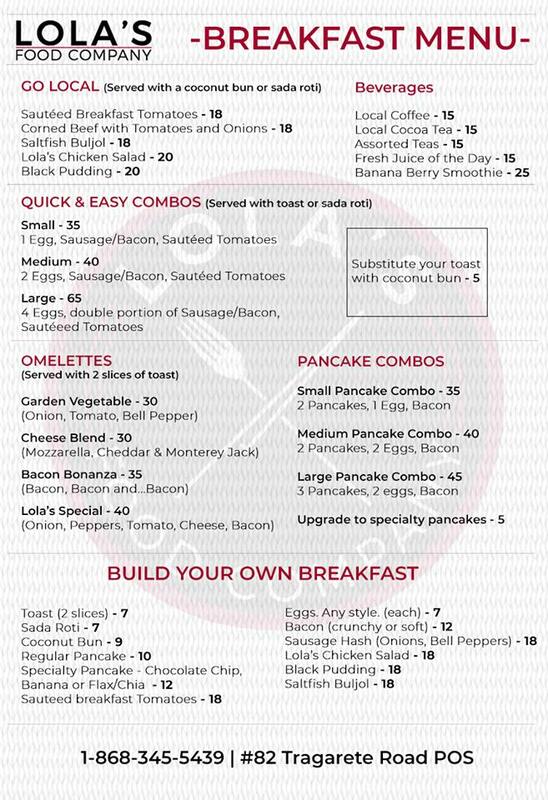 Link to Dolce’s breakfast menu. Sunday Brunch (buffet) on the last Sunday of the month 11am to 3pm. Link to sample menu. PRICE – $200 inclusive of ALL taxes; children 12 years and under are half price and children under 5 years are free. Sunday Brunch (buffet) $150/person exclusive of VAT and service charge at Glencoe, Maraval, Price Plaza and Point-a-Pierre locations. PRICES and menus may vary according to locations. Sunday Breakfast at Peche Chaguanas (a la carte menu) 8:30am-11:30am. Sunday Brunch (buffet) 8am to 12pm. 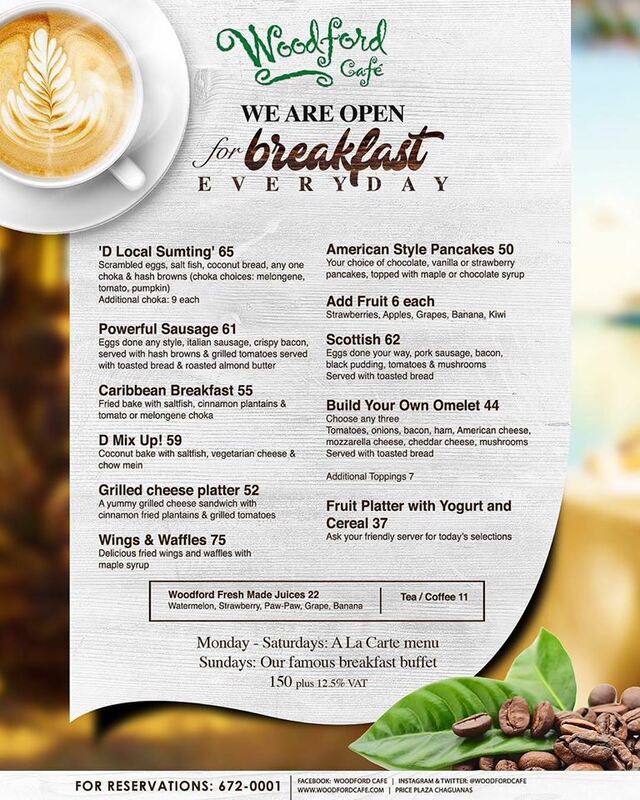 At $150 plus VAT, Woodford Cafe’s “Sunday Breakfast Buffet” is one of Trinidad’s best deals for Sunday brunch. Buffet options include “eggs, bacon, sausages, pumpkin, chicken salad, cheese, cereal, fresh fruit, chocolate cake squares, french toast, croissants, bread, plantains and salt fish.” PRICE – $150 plus VAT; children under 12 years old eat free from the kids menu all day. Offers an a la carte breakfast menu Monday-Saturday (link to a la carte breakfast menu). Link to Breakfast in Tobago! NOTE: Every effort is made to keep this list updated, but please call to confirm brunch availability, times, menus and prices. All menus and prices as well as the days and times are subject to being withdrawn or changed at the restaurant’s discretion. Tags: Breakfast Trinidad Restaurants, Brunch Trinidad Restaurants, Trinidad Restaurant Guide. Bookmark the permalink. TGI Friday’s no longer carries Sunday breakfast. Thank you Mandy, we’ve updated the list. Just to update anyone interested, Esca’s Sunday brunch is now $149 plus VAT. tried a few on the list already. yet to deal with the waterfront. woodford sounds like the next ticket. thanks for the LE BRUNCH link. hope yuh there next time! !